한국과 미국은 수년 동안 실무 차원에서 매우 긴밀한 군사 관계를 개발해왔다. 한국은 미국으로부터 전투기를 비롯 필요한 군사 장비를 받고 있을 뿐 아니라 미군과 한국군은 ‘연합사’라는 이름으로 움직이고 있다. 한국의 보수들이 문재인의 활동을 주시하겠지만 문재인은 한미 관계와 그에 수반된 의무들을 이행하는 데 최우선 순위를 둬야 한다. 그것은 북한이 문재인의 제안들을 결국 거부할지라도 그가 살려야 할 한미동맹의 기초를 다지는 역할을 할 것이기 때문이다. The "victory" of Moon Jae-in in the presidential election makes him a minority president confronting two powerful foes who together easily defeated him in the vote count. With 60 percent of the voters in favor of someone other than Moon, he has no clear mandate to jettison the pro-American policies of Korean presidents since the founding of the Republic of Korea under Syngman Rhee in 1948. Although the Liberty Korea Party candidate, Hong Joon-pyo, lost by a rather wide margin, the fact that he did as well as he did shows the power of the Taegukgi-waving protesters who finally came to life after seeing the power of the candlestick crowds in central Seoul. Had Hong and Ahn Cheol-soo managed to combine forces, one of them would have been elected president. Victory might have been still more decisive had Yoo Seong-min not formed his Bareun Party with a breakaway faction from the Saenuri. The curious breakdown of the votes leaves relations between Seoul and Washington in a state of flux. Clearly Moon is not going to be as enthusiastic about the U.S.-ROK alliance as would either Hong or Ahn. At the same time, he cannot so easily violate agreements made between the U.S. and the outgoing conservative government. For instance, both Hong and Ahn support the decision to plant THAAD, Terminal High Altitude Area Defense, on the former Lotte golf course well south of Seoul. They have both said it should definitely stay there. Moon has not wanted to appear so far to the left as to call for its removal but has said he would not have approved it and the National Assembly should have voted on it. Although Moon might want to appear as a rabble-rousing leftist, he knows that he will face severe opposition from possibly a majority of the Korean people. He will not even be able to muster a majority in the National Assembly if the Liberty Korea Party and Ahn's People's Party and Yoo's Bareun finally join forces. Under these circumstances, Moon, for the sake of survival, indeed to avoid an eventual impeachment vote by the assembly, has had to endorse the U.S.-ROK alliance. In that spirit, he should go to Washington in the fairly near future to meet President Trump even though he was widely quoted during his campaign as saying that he would prefer to go to Pyongyang and meet Kim Jong-un before going to Washington to meet the American president. It would be unfortunate if Moon, before going to Washington, decided to pay no attention to the successful recent visits to Korea of three Americans with broad policy influence. First there was Defense Secretary James Mattis, then Secretary of State Rex Tillerson and, finally, Vice President Mike. Pence. All three proclaimed the "ironclad" relationship between the U.S. and South Korea, Tillerson made a point of saying the era of "strategic patience" was over and "all options" were possible. Moon has said repeatedly that he would like to "engage" North Korea in dialogue in hopes of reaching an understanding. He clearly is a proponent of the Sunshine policy reconciliation initiated by the late President Kim Dae Jung and perpetuated under DJ's successor, the late President Roh Moh-hyun, whom he served as chief of staff. The visits of both these men to Pyongyang to meet Kim Jong-il undoubtedly led to Moon's thinking that he should go on a similar mission. Considering Moon's eagerness for negotiations with the North, Trump, and his team will be dealing very carefully with Moon. They don't want to be accused of exerting undue pressure on him. Nor do they want him undermining the U.S.-RoK alliance. U.S. forces would like to be able to conduct annual war games even though they infuriate North Korea . Moon's relationship with the U.S. will be complicated by some of Trump's remarks. South Korea under any president, conservative or liberal, would not consider paying $1 billion as Trump suggested was owed for THAAD. The outgoing conservatives also repudiated the bill. Trump is adding to controversy by calling for renegotiation of KORUS, the Korea-U.S. Free Trade Agreement. Neither conservatives not liberals, neither rightist nor leftists, would be inclined to renegotiate KORUS. Obviously Moon will ignore and resist Trump's demands. 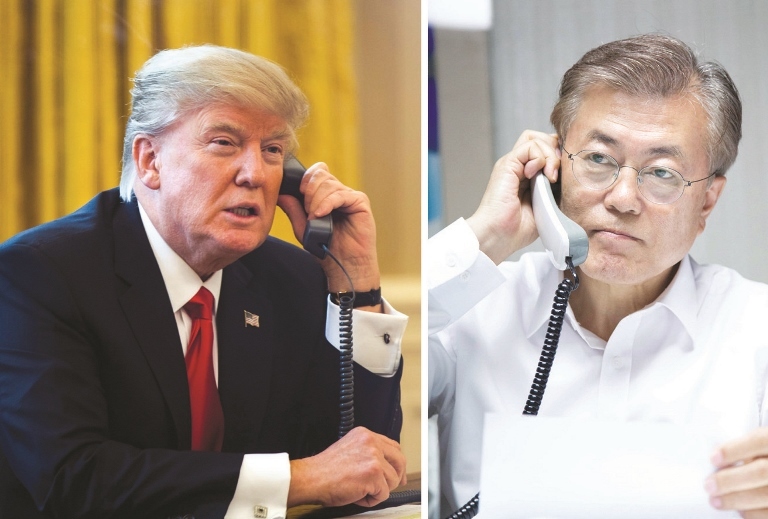 Moon, however, will make other decisions that might undermine relations between Washington and Seoul. His response to more North Korean missile tests, or a sixth nuclear test, will be a clear indication of his basic outlook. How willing will Moon be in terms of enforcing sanctions or adopting other stringent measures for dealing with North Korea? And what if North and South Korea came to blows again in the Yellow Sea, especially at the height of the crabbing season in June? Washington would want to rush to his aid in a showdown, but would Moon welcome such assistance? South Korea and the U.S. over the years have developed extremely close military relations on a working level. U.S. and Korean forces coordinate under a "combined command"while the South acquires much needed military equipment, including fighter planes, from the U.S. Moon, while the conservatives keep close watch on whatever he's doing, should place highest priority on all these relationships and obligations. They help form the bedrock of the alliance, which Moon needs to nurture even if North Korea in the end rejects his overtures.